Scrabble is a unique gift for dads and grandpas for birthday or Christmas! Enjoy this classic game with the whole family on game nights and at family parties! Scrabble has been around since the 1930s, but this classic board game still has appeal today! Grab a few friends or family members and set up a game to while away a rainy afternoon or give your brain a workout! 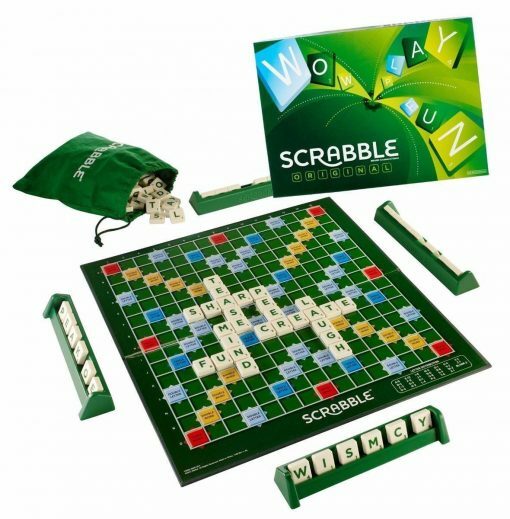 Scrabble is perfect for classrooms, youth groups and retirement homes as well as for families! Playing Scrabble together is a great way for adults to connect with kids and for older adults especially it will help keep their word power sharp. Younger players will learn word skills as well as strategy and will enjoy feeling closer to their older family members through playing a game that everyone enjoys! Scrabble can be played competitively and online versions of it exist, but nothing beats the joy of playing the original board game with close friends or family! It’s a friendly kind of challenge that stimulates the mind and encourages bonding between generations. “If it ain’t broke don’t fix it” applies here as the game of Scrabble hasn’t changed too much over the years. The aim is to score points by making words from the seven tiles you’re assigned each turn. Make a more complex word or place it over a “double word score” spot and you’ll score extra! This classic word play game makes a unique gift for older members of the family such as dads and granddads to help them stay connected to the family and work out those word powers! Order the game today for his birthday or Christmas gift!